In December 1986 the company Danish Commercial Energy Research, who produced the Aerostar blades - went bankrupt. Except for Bonus, this happened to most of the Danish wind power companies including Vestas and Nordtank, as the Californian wind rush suddenly stopped in 1986. My new AeroForm test center at Sparkær was inaugurated in august, and staff employed - 3 month later our main customer DCER thus bankrupted and owed us 1.2 mio Danish kroner. As a private independent Test Center we tested flagpoles, fibreglass tanks and also wind turbine blade hubs. As we used to be working close together with Aerostar it took some time before the competitor LM Glasfiber, became a customer. The ice was broken, when Henrik Stiesdal of Bonus, as a customer to LM asked LM Glasfiber to request us to perform a test of the uniformity of 6 standard LM 11 meter blades. 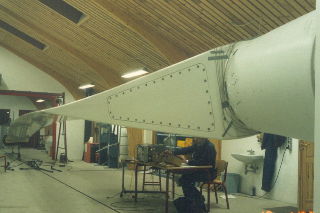 As RISØ did not have a test rig for blades longer than 11 meter, longer blades had to be tested at my AeroForm test rig at Sparkær. In 1988 RISØ wanted to enlarge their facilities at Risø, near Copenhagen. Kind people "told" the minister of energy, that a fully equipped test center already existed in the western part of Denmark - namely at Sparkær. After nearly 3 years of negotiations and meetings, an agreement was signed between RISØ and AeroForm. RISØ acquired the technical equipment from AeroForm and rented the buildings, land and test rigs as from July 1991. Erik Grove-Nielsen was employed as a local head of the blade test facility.